We were born in Adam's likeness, spiritually dead and inherently a sinner. Romans 5:12, "Wherefore, as by one man (Adam) sin entered into the world, and death by sin; and so death passed upon all men, for that all have sinned." The Bible clearly says that all men are sinners and its payment according to Romans 6:23 is death. However, Jesus died as a ransom for sin to set you free and to give you everlasting life. John 3:16 summarizes, "For God so loved the world, that he gave his only begotten Son, that whosoever believeth in him should not perish, but have everlasting life." Ephesians 2:8-9, "For by grace are ye saved through faith; and that not of yourselves: it is the gift of God: Not of works, lest any man should boast." The Bible teaches us that salvation cannot be merited by good works or moral conduct. Man will not be justified by his own goodness but by the grace of God through faith in Jesus Christ. Titus 3:5-6, "Not by works of righteousness which we have done, but according to his mercy he saved us, by the washing of regeneration, and renewing of the Holy Ghost; Which he shed on us abundantly through Jesus Christ our Saviour." 1John 5:11-12, "And this is the record, that God hath given to us eternal life, and this life is in his Son. He that hath the Son hath life; and he that hath not the Son of God hath not life." Eternal salvation is not based on my good works, salvation is based on the work Jesus Christ did on the cross and it begins the moment you accept Him as your personal Saviour. Open your heart to the truth of the Bible and accept Christ today. Romans 10:9, "That if thou shalt confess with thy mouth the Lord Jesus, and shalt believe in thine heart that God hath raised him from the dead, thou shalt be saved." We believe there is one God eternally existent in three persons: Father, Son, and Holy Spirit (Deut. 6:4, 4:35; Matt. 3:16-17; Ps. 9:7; Jn. 10:30; Jn. 14:26; 1 Jn. 5:7). We believe in the Deity of Christ; His virgin birth; His shed blood for atonement of sin; His bodily resurrection; His ascension into Heaven, there to be our Intercessor; His Lordship over all creation (Jn. 1: 1-3; 1 Jn. 1:7; Heb. 9:11, 12; 1 Pet. 1:18-19; 1 Cor. 15:3-4; Rom. 8:34; Heb. 7:25; Matt. 28:18, Phil. 2:9-11). We believe that the Holy Spirit convicts of sin, makes believers children of God through the new birth, assuring them of Heaven, and by His indwelling enables Christians to live a Godly life (Jn. 16:8-11; Titus 3:5; 1 Cor. 12:13; 1 Cor. 6:19-20; Rom. 8: 14, 16; Rom. 8: 1-4; Gal. 5:16; Eph. 5:9,18). We believe that all men are sinners by nature and choice, sinful and lost, and have within themselves no possible means of salvation without Christ (Rom. 3:10, 23; Rom. 5:12; Eph. 2:8-9; Eph. 2:1-3, 12; Titus 3:5). We believe in Salvation by grace through faith; that Salvation is the free gift of God, not by any virtue or works of man, but received only by personal faith in the Lord Jesus Christ; and that all true believers possess the gift of eternal life, a perfect righteousness, son-ship in the family of God, and the divine guarantee that they shall never perish (Jn. 3:16; Eph. 2:8-9; Titus 3:5; Jn. 1:12; Jn. 10:28; Jn. 3:18). We believe in the existence of Satan the deceiver and god of this present world; that he was defeated and judged at the cross, and therefore his final doom is certain (Jn. 8:44; Job 1:6-12; Job 2:1-8; 2 Cor. 4:4; Eph. 2:2; 1 Jn. 3:8; 1 Jn. 5:18; 1 Jn. 4:4; Rev. 20:10). We believe in the return of Jesus Christ; the time being unrevealed but always imminent; that when He comes He will first by resurrection of the dead and the translation (rapture) of the living remove from the earth His own; then pour out the righteous judgments of God upon the unbelieving world, afterwards descend with His own and establish His glorious and literal kingdom over all nations for a thousand years (Jn. 14:1-3; Acts 1: 11; 1 Thess. 4:13-1 8; 1 Cor. 15:51-57; Rev. 6-9; Rev. 19:11-20:6). We believe that the spirits of the saved, at death, go immediately to be with Christ in Heaven; that at His coming their works will be judged and rewards determined; that the spirits of the unsaved at death descend immediately into Hell until the final day of judgment, at which time their bodies shall be raised from the grave, judged, and cast into the lake of fire, the place of final and everlasting punishment (2 Cor. 5:6-1 0; Luke 16:19-3 1; Rev. 20:11-15). We believe in the priesthood of all believers, that Christ is our High Priest and through Him every born-again person has direct access into God’s presence without the need of a human priest; that the believer has the right and responsibility to personally study to learn the Scriptures, guided by the Holy Spirit (1 Pet. 2:9; 1 Tim. 2:5; Heb. 7:17-28; Heb. 6:20; Heb. 4:14-16; Jn. 14:26; Jn. 16:13; 2 Pet. 1:19-21; 1 Pet. 2:2; 2 Tim. 2:15). We believe the officers of the church are pastors and deacons. In Scripture the pastor is also referred to as an elder. The two terms describe the same office (1 Tim. 3:1-13; Phil. 1:4). We believe the ordinances of the church are Christian baptism and the Lord’s Table. We believe in the Separation of Church and State; that God has ordained both, and has delegated authority to each; the authority of one must not interfere with the other; however, this does not mean that the State is to be non-religious nor does it mean that the church and its members may not be involved in the political processes of this nation (Matt. 16:18; Matt. 18:15-20; Rom. 13:1-7; Acts 2: 1-11, 41-47; Eph. 2:1-6). Not forsaking the assembling of ourselves…but exhorting one another. Pastor Faulk and his wife Laura were saved on Sunday, March 19, 1978. Reassured of a call to preach in October of that same year Pastor enrolled at Hyles-Anderson College to prepare for full-time ministry. He began in the Fall semester of 1979 and graduated in 1984. 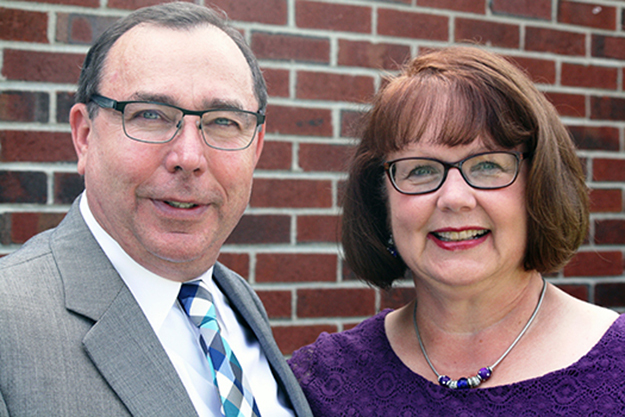 Pastor and Laura have faithfully served the Lord for 40 years which includes Christian Education, Bible Institute, and pastoral ministries. Twenty of those years have been in New England. He loves people and desires to help them grow in their faith. He is passionate about church planting in New England as well and has been influential in helping to start churches in the Northeast. Pastor Aaron McCarthy upon being led of God moved to Massachusetts in June of 2010 to assist Pastor Faulk at FBC Groton. 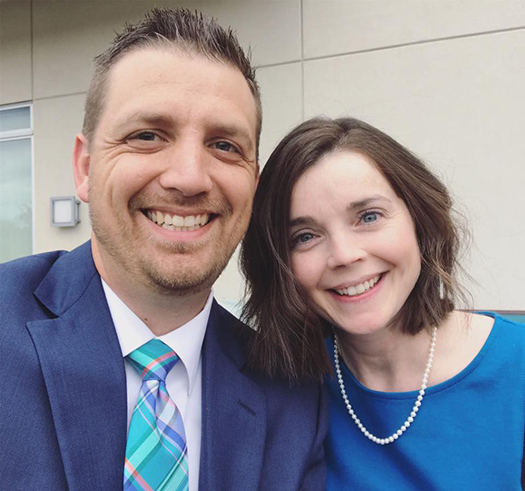 Brother McCarthy serves as the assistant pastor and youth director at FBC. Saved at age 20, Aaron gave his heart to the Lord. Not long after salvation, he knew God was calling him to preach. For the next several years, he completed a Bible Institute program. In 2016, he was ordained to pastoral ministry. Aaron and his wife, Shannon and their two children Lauryn and Greyson lovingly and faithfully serve the Lord and their church family. Burdened for New England, they are excited about what God is doing at FBC Groton. We would love to meet you! If you have any questions please let us know. It is our privilege to serve you!